Saffron is the most expensive spice in the world, commanding $20 for a single gram of premium grade Kashmiri or Spanish saffron, and easily $5000/kg in bulk. These precious deep red threads lend dishes a subtle but luxurious fragrance, flavor, and bright golden color. The high market value of this spice has made it a target for adulteration throughout the ages –reported in early Roman times by Pliny, and punishable by execution in Europe’s Middle Ages under the Safranschou code. Saffron threads are the dried stigmas of the Crocus sativus L. plant, a cultivar of the iris family. Those seeking to stretch their profits may include crocus stamens or add fibers from beets, pomegranates, or corn silk to boost weight; ground saffron is frequently cut with similar colored spices like turmeric or paprika. 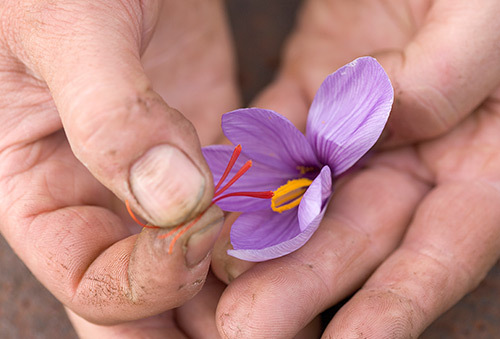 Even when saffron is 100% pure, it may be mixed with lower grade or less flavorful older harvests to increase profits. Why is saffron so expensive? The purple flowers of the C. sativus bloom over a 6-week period each year, during which time the flowers are harvested, and each pistil is picked by hand – just three per flower. The pistil varies from yellow at its base (the style) to red at the tip (the stigma), and is dried over charcoal to develop its full flavor and aroma. Forty hours of labor are needed to pick the ~150,000 flowers needed to produce 1 kilogram of saffron threads, with careful attention to ensure the highest quality. Advanced analytical methods like NMR and DNA barcoding can be used to authenticate this precious crop, but are quite costly. The industry standard for evaluation of saffron quality is ISO 3632‐1/2, which combines microscopic examination of the threads and measurement of moisture, volatile matter, and ash content to rule out the use of fillers, while spectrophotometric measurements ensure freshness and quality. Saffron owes its characteristics to three key compounds, all of which can be measured using UV-VIS absorbance. The spice gains its vibrant yellow-red color from crocin, an ester of the carotenoid crocetin, causing a strong absorbance peak at 440 nm. Saffron’s flavor can be attributed to picrocrocin, measured via the ISO standard at 257 nm. The characteristic scent of saffron comes from safranal, which is generated from picrocrocin as a result of combined heat and enzymatic action during the drying process, and is monitored at 330 nm. 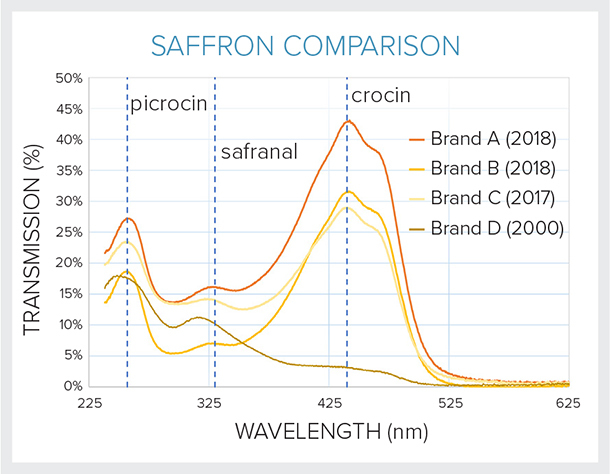 Though the balance of all three compounds is ultimately determines how highly a saffron will be rated, the crocin levels or “coloring strength” at 440 nm is the lead indicator for quality and often price. Curious to see how the concentration of these compounds might vary amongst brands, we tested four different sources of saffron, ranging from freshly opened to 18 years old. For each sample, a 50 mg/L solution was prepared in distilled water, then filtered to obtain a clear sample. Each sample was measured in cuvette using a WP UV-VIS spectrometer with 25 µm slit, covering 240-850 nm with 2.5 nm resolution. A deuterium tungsten lamp was used as the light source, and acquisition time was set to 18 ms with 10 averages to maximize signal to noise. Peaks for each of the three major compounds were clearly observed, though with varying relative peak heights. The oldest sample was found to have the lowest levels of crocin, which can be attributed to aging of the saffron. Like many carotenoids, crocin degrades over time, accelerated by exposure to heat and light. It is recommended to use saffron threads within four years, though storage in an airtight container away from heat, moisture and light can slow down the aging process. The saffron which had been open for one year had the second lowest crocin levels, particularly relative to its other components. Interestingly enough, safranal levels have been observed to increase for up to three years in stored saffron, then decrease again from five years of age – an effect which may account for the high levels seen in brands A and B. Variation in relative crocin, picrocin, and safranal levels between samples is expected due to differences in climate and growing conditions, and on the specific cultivation and processing techniques passed down from one generation to the next. Of these, the drying process has the greatest impact on quality, as drying initiates the chemical changes needed to develop the flavor component, safranal, influencing the balance between color, bitterness, and aroma that is the pride of producers of high quality saffron. Some producers choose to dry over almond charcoal using a sieve, while others use olive or oak, varying the drying time with the depth of the layer of saffron and the eye of experience. Regardless of the origin of saffron or the drying process used, UV-VIS absorbance has proven itself a reliable and consistent technique to validate the quality of this expensive spice. In fact, as our understanding of it improves, some researchers are recommending a move to a more sophisticated chemometric analysis that takes into account overlap of the contributing spectral components of crocin, picrocin, and safranal. 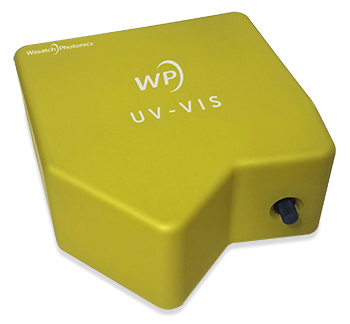 Given that almost every saffron producer must have a spectrophotometer for quality analysis, such advances could benefit from a compact, repeatable UV-VIS absorbance system based on our WP UV-VIS spectrometer. So of the saffron samples tested, which is truly the highest quality? Without doubt, saffron should be used within a few years of opening, and possibly after a bit of aging (if you prefer a stronger flavor). We can tell you that Brand A was the most expensive, a Spanish Coupé saffron from a reputable online spice provider. But which would taste the best? Only you can decide whether the quality merits the price. 2. ISO 3632‐1/2. “Saffron (Crocus sativus Linneaus). Parts 1&2: Specifications. International Organization For Standardization.” (2010). 3. Sánchez, Ana M., et al. “Rapid determination of crocetin esters and picrocrocin from saffron spice (Crocus sativus L.) using UV–visible spectrophotometry for quality control.” Journal of agricultural and food chemistry 56.9 (2008): 3167-3175. 4. Del Campo, C. Priscila, et al. “Picrocrocin content and quality categories in different (345) worldwide samples of saffron (Crocus sativus L.).” Journal of agricultural and food chemistry58.2 (2009): 1305-1312. 5. D’Auria, Maurizio, et al. “Use of SPME-GC-MS in the study of time evolution of the constituents of saffron aroma: modifications of the composition during storage.” Journal of chromatographic science 44.1 (2006): 18-21.